Green tea is made from the leaves of the plant Camellia sinensis that have been processed using oxidation. The beverage has its origins in China, but has recently become more popular in the West. 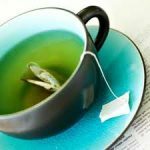 The recent increased popularity of green tea in the West is largely due to research over the last couple of decades revealing the many health benefits of the drink. Green tea appears to be effective in preventing cardiovascular disease, dental cavities and gum disease, certain forms of cancer, and promoting weight loss. Chemical components of green tea include carotenoids, ascorbic acid (Vitamin C), epigallocatechin gallate, chromium, magnesium, selenium, and numerous polyphenols. It is a more powerful antioxidant than black tea. Studies suggest that green tea can lower the risk of developing cardiovascular disease, kidney stones, dental cavities, while improving brain function and even bone density. Some of the human studies have been inconsistent, and research is still ongoing. A University of Birmingham study found that oxidation rates of fat were 17 percent higher after consumption of green tea than placebo. The study suggests that green tea or green tea extract can not only increase fat oxidation during exercise, but improve glucose tolerance and insulin sensitivity. A Queen Margaret University at Edinburgh study studied the impact of green tea consumption among students whose ages ranged from 19 to 37 years old. Subjects were instructed to maintain their current diets, while drinking 4 cups of green tea daily for 14 days. The study concluded that green tea consumption reduced blood pressure, body fat and body weight, and total cholesterol. The study suggested that overweight people may see more significant reductions in these areas than those of normal weight. An Israel Institute of Technology study showed that EGCG, the main antioxidant component of green tea, helped prevent mice brain cells from dying. It also helped restore previously damaged brain cells. The Michael J. Fox foundation is currently conducting tests on early onset Parkinson’s patients. Green tea also appears to have a powerful effect upon our immune systems. Research has found that the EGCG in green tea has the effect of increasing the number of T cells and boosting the immune system, as well as reducing the effects of autoimmune conditions. Autoimmune diseases occur when the body turns on itself and unleashes its own immune system against healthy cells in the body. This can happen when we are undergoing an infection or allergic attack. Green tea increases the number of regulatory T cells that help turn off unwanted immune reactions. A study at Yale University reviewed over 100 studies on the health promoting effects of green tea, examining what’s become known as the “Asian paradox”- the relatively lower rates of cancer and heart disease in Asia, even though Asians smoke more cigarettes. Asians drink about 1 liter of green tea per day on average. The researchers concluded that compounds in green tea help improve heart health, keep blood from clotting, and lower levels of bad cholesterol. This effect helps prevent plaque buildup in arteries and lowers the risk of heart attack. Green tea can also help reduce anxiety and promote calm. L-Theanine, an amino acid found in the beverage, helps counter the effects of caffeine and promote relaxation approximately 35 minutes after ingestion. It also increases the predominance of alpha waves in the brain that are associated with a mood best described as “calm alertness”.